The Jordanian government has expressed willingness to hand over Sajida al-Rishawi, a woman who failed in her suicide bombing mission and has been on death row since 2005, to the ISIS militants. They are willing to release her to ensure the safe release of their pilot Muadh “Maaz” al-Kasesbeh held hostage by the ISIS since December 2014. The captive militant of Iraqi origin had taken part in a deadly spree of hotel bombings in 2005. It is not yet clear whether the deal to free the pilot Lt. Moaz Kasabeh would also ensure the safe release of Kenji Moto, a Japanese journalist who has also been held captive by the ISIS. 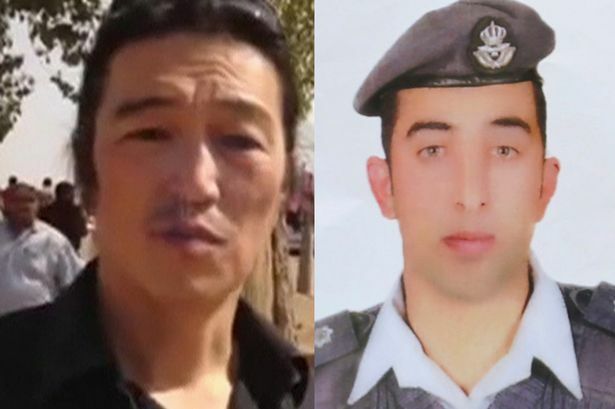 The fates of the Jordanian pilot and the Japanese journalist have got entwined by some queer quirk of fate as the ISIS militants have threatened to kill both the men together if Sajida is not released. “Jordan is ready to release the Iraqi prisoner Sajida al-Rishawi, if the Jordanian pilot al-Kasesbeh is released unharmed,” spokesman Mohammed al-Momani said, responding to a demand from the militant group in a video on Tuesday. The Jordanian government has softened its stand as the 24-hour deadline imposed by the Islamic State for Rishawi’s release drew to a close. The militants communicated the time limit to Jordan in a video message released Tuesday. The message shows the Japanese war reporter Kenji Goto, held captive by the ISIS since October. The voice in the message says: “The only barrier between me and my freedom is now just the Jordanian government, and the delaying handover of Sajida. It adds: “Tell the Japanese government to put all their political pressure on the Jordanian government. Time is now running very short. It is me for her, what is so difficult to understand. Her for me — a straight exchange. Japan’s Prime Minister Shinzo Abe was enraged at the video apparently showing hostage Kenji Goto saying he could be killed in 24 hours. Japanese officials are working closely with the Jordanian authorities and the two have stepped up the ante to ensure that the two people held hostages by the ISIS are released safely. The militants already claim to have slain a Japanese security specialist Haruna Yukawa who was in their custody.